Paton distributed questionnaires asking people how many animals they thought their cat(s) had killed in the previous 12 months. Paton himself recognises that the results are nothing more than a "guesstimate", and yet his figures are widely quoted as if they were fact. 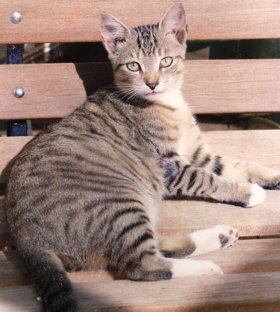 Of the 3000 questionnaires distributed by Paton (1991), 709 were returned, covering 700 cats in Adelaide suburbs, in country towns and in rural areas. The majority of the questionnaires (88%) came from members of the SA Ornithological Society and the Bird Observers Club, hardly a representative sample of the population. Cats in rural areas were reported to catch over twice as many prey as suburban cats. The average number of prey reported caught per year was 30. Suburban cats (the majority of cats) were reported to catch less, and rural cats (far fewer in number) caught more. However, in his discussion Paton assumes that each suburban cat catches 30 prey a year, even though this is the average, not what suburban cats caught. He notes that the most frequently caught birds included turtle doves, blackbirds, starlings and house sparrows (all introduced, not native), and that frequently recorded mammals were house mice, rats and rabbits (all introduced, not native). Nevertheless, he wants to claim that suburban cats are a dire threat to native wildlife (3).